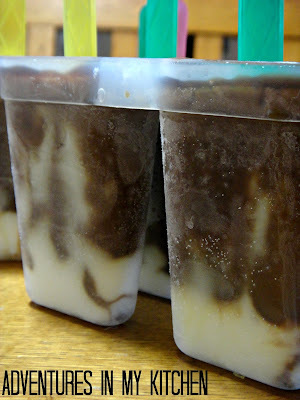 theFoodette & Family: Root Beer Float Pops- with greek yogurt! 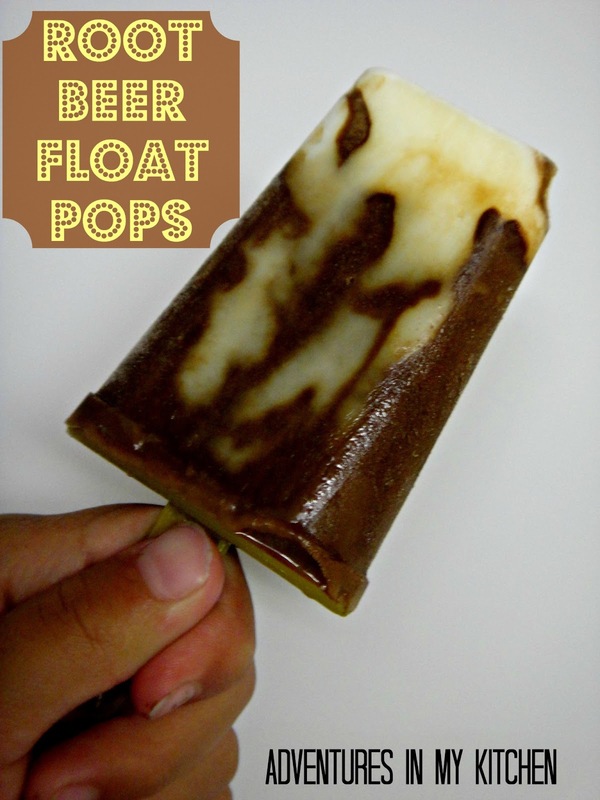 Root Beer Float Pops- with greek yogurt! Here's another fun recipe that you can do with your kids! No stove required for this one! There's not much better than a popsicle on a hot day, plus Root Beer Floats are a classic! I know you're gonna love these! Instead of using vanilla ice cream on the bottoms, I decided to use Vanilla Greek Yogurt. The yogurt part didn't turn out quite as creamy as I had hoped, but I think it's because I used 0% greek yogurt, probably should have used 2% for more creaminess. Greek Yogurt contains less calories, fat, and sugar than vanilla ice cream, plus it has more good stuff like protein, calcium, and good bacteria! The kiddos loved it! I've been making a lot of popsicles this summer. It's a great way to use up fruit juice and fruit that's going to spoil. Or if you accidentally make a little too much smoothie, pour the excess into some popsicle molds and viola! You've got a healthy snack! Vanilla Greek Yogurt- 0% or 2%- 1 tsp per popsicle mold. Drop 1 tsp of yogurt into each popsicle mold- put in freezer to set. Combine hot water and sugar in a large bowl, stir until sugar is completely dissolved. Stir in root beer and vanilla extracts. When liquid a cool, stir in the cream. Pour root beer liquid into popsicle molds being careful to leave room for the stick. Insert stick and place molds into freezer for 6-8 hours. *tip- if 1 tsp of yogurt per container is not enough, keep dropping until you have a good amount to make the tip of the pop. I have small molds, so 1 tsp worked for me! Have you entered my giveaway?? These sound really tasty! Love root beer floats. Bookmarking this recipe--it may be the only way to get my kiddos to eat greek yogurt ;) Thx for sharing! Hi, I just stopped by from A HAPPY Day hop. This recipe sounds perfect for the kids. I will definitely make this with my grandsons. Yum! Yum! Yum! Thank you for spreading JOY and sharing at the Oh What a HAPPY Day party. I love root beer floats and greek yogurt! This is a great idea to stay cool. Visiting from a HAPPY Day party! I would love for you to share and link up at my weekly TGIF Link Party if you haven't already this week. Your favorite posts, most popular, recent or new! The party is open every Thursday night and closes Tuesday's at midnight. Followed by (Not SO) Wordless Wednesday! http://apeekintomyparadise.blogspot.com/. I have seen your post on Social Sundays and on Tuesday's Table and I had to stop by. 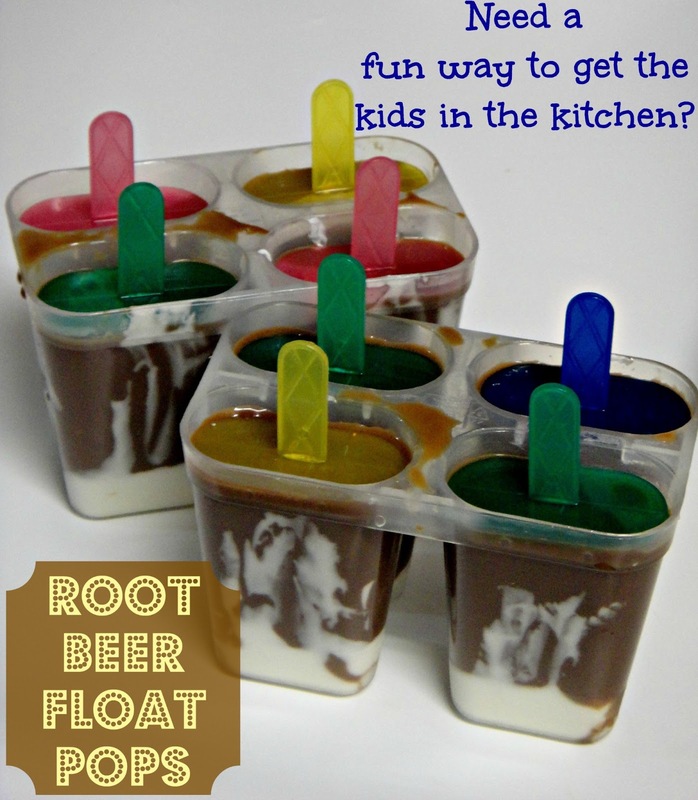 I love root beer floats and this looks like a healthier alternative for Mom & kids alike. Do you have a preferred pop maker? haha you could, I totally understand! :-) however, just using soda results in a more "icy" pop... adding the bit of cream to the water/sugar/extract mixture makes for a slightly more creamy, less icy pop.